Dar, Ellis, and the whole tent had a huge smile on their face! That is a great story. I love how the crowd went from reverence to joyous eruption when they realized he was there. Thanks for sharing this with me. Lovely story Zulu Delta. I attend the National Folk Festival here every year (though will miss this year’s because I’ll be in the US and Canada). How wonderful it would have been to have Pete Seeger turn up at the back of a tent like that! What a lovely story, karma can be funny sometimes. Thank you, Zulu Delta, for posting on my blog. I am glad to include your link – great story. I never met Pete Seeger, but my wife did when she was a girl. She still has a couple of old 45s bearing his signature – precious memories, indeed. What goes around sometimes comes around gently. Thank you for the memory of Pete and these two wonderful folk singers. And thank you for the “like” of the post on Views from the Edge. We need to keep singing, keep his spirit alive in the world. Wonderful story thanks, had a ticket to see Pete, I think it was 1983 in Vancouver. The night before the festival my co-worker tripped over an 8 year old, playing Capture The Flag…he broke his arm, so I could not go. The 8 year old was unharmed. Dear Pete- what a Hootenanny there must where he has gone!! My Old Man HATED Communists. As in, “The only Good Red Is A …”. Literally. It wasn’t ideological with him so much as it was personal. Almost two years in a POW camp (Korea) seeing his comrades die and be broken. Being interrogated by special Russian interrogators used for high-grade propaganda/intel captives. The guys that wrote the book on interrogation that we today, having met the enemy and become them, use in Gitmo, Abu G, and only our guv knows else where – we the peeps don’t have a “need” to know. But when my older sister learned to play guitar under his intermittent and irascible tutelage they used a Pete Seeger songbook. The only concert I ever remember him attending was one he took me to in the 60s. Pete Seeger. Guess my dad was surrounded by Pete’s machine and forced to surrender. Thanks for your story. I have been to Gitmo twice; It was bad enough to have the stigma of unanswered questions as why we can talk to North Korea but not Castro, but the nonsense with the illegal prison there is so wrong……..Zulu. My non-farewell to The Troubadour. Himself. Great anecdote and a fabulous memory take keep with you. Love the reminiscence of Pete, zuludelta45, and glad you enjoyed mine at Oy Vey Rockaway, http://www.rockviv.com. 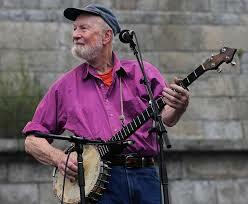 There’s a big gaping hole in my heart, for everything that Pete Seeger represented. Thank you. What is your new project?